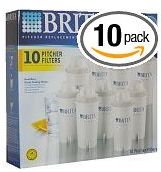 Here is an awesome bargain price on a 10 pack of Brita Pitcher Replacement Filters. This 10 pack is selling for $43.61 with FREE shipping. That’s only $4.36 per filter. The lowest I have ever found is around $5.00 each.